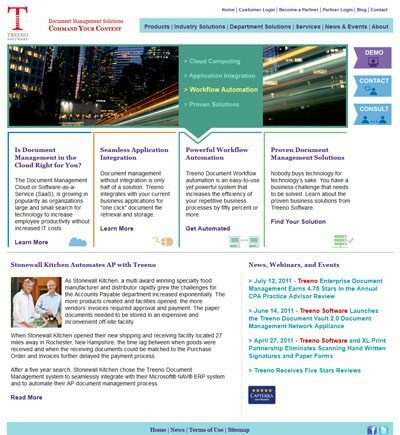 An updated Portsmouth, NH business site to promote a document management services product. A client, based in Portsmouth, NH, had an existing website that was difficult to update, and no longer fit their needs. They had ideas on how to re-design the web site, and they needed a reliable developer who could make changes rapidly and reliably. Working closely with the marketing department a new home page layout was created, and a design for the secondary pages. This updated home page was rapidly developed with hand-edited PHP/HTML/CSS code.